If you have read my previous posts on Salted Chocolate All Nut Butter then you already know that I had questionable amounts of chocolate hibernating in my fridge until recently. And the months it spent in my fridge only made me crave a no bake chocolate ganache tart. My experiments with no bake tarts have never never disappointed me and my spouse. I tried making a White Chocolate Ganache with Strawberry tart this year for Valentines’ and I’m proud to say that it did taste as good it looked. I find the biscuit crust tarts easy to make as I do not have a convection oven in my tiny kitchen. While I have tried using milk and dark chocolate in a tart earlier, this time I wanted to add some flavours I had not tried before. Enter Coconut and Sea salt! 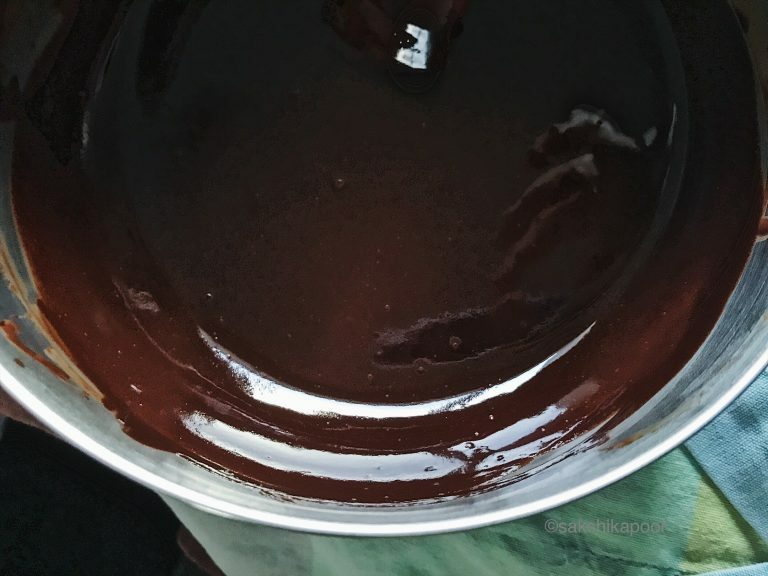 I came across a ganache recipe using coconut oil recently at Sangeeta Khanna’s blog and wanted to give it a try. Coconut oil is usually stocked in my pantry while cream of any kind, is often not. 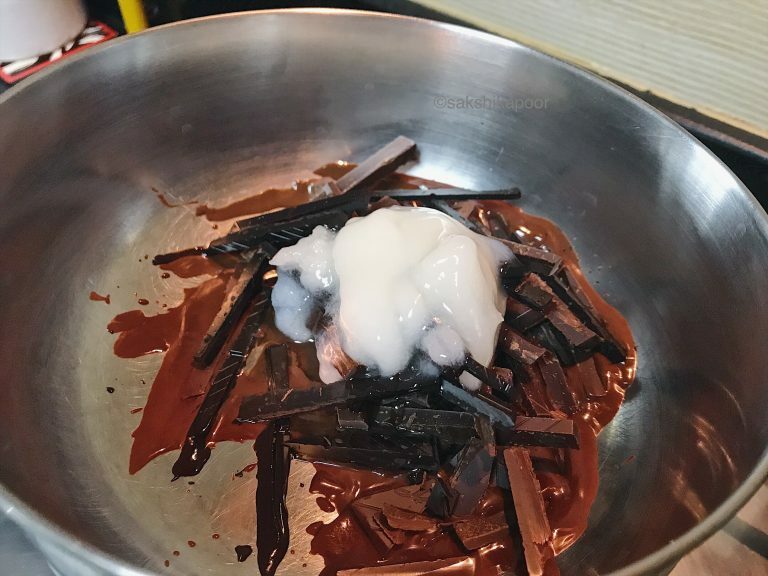 Last time I had made Ganache, I had used cream with white chocolate but this time I had other plans. Since I had decided on using coconut oil, I thought the crust too should have a bit of coconut flavour. I used Mcvities light biscuits this time too, but added a teaspoon of toasted coconut flakes and a few Britania Nice time biscuits which are coconut flavoured. This of course is optional and you could put either or entire skip this step. As for the salt, I think a bit of salt in certain dishes does enhance the flavour many folds. A pinch of salt certainly takes a mug of hot chocolate to another level. So why not add it to the tart too. But remember, a little goes a long way. And this is not a savory tart! 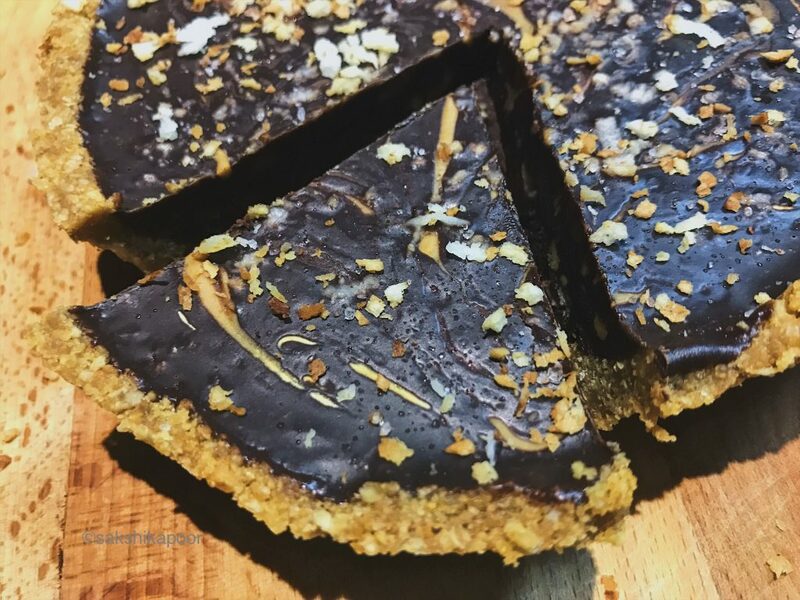 It is just a simple Salted Chocolate Ganache Tart. 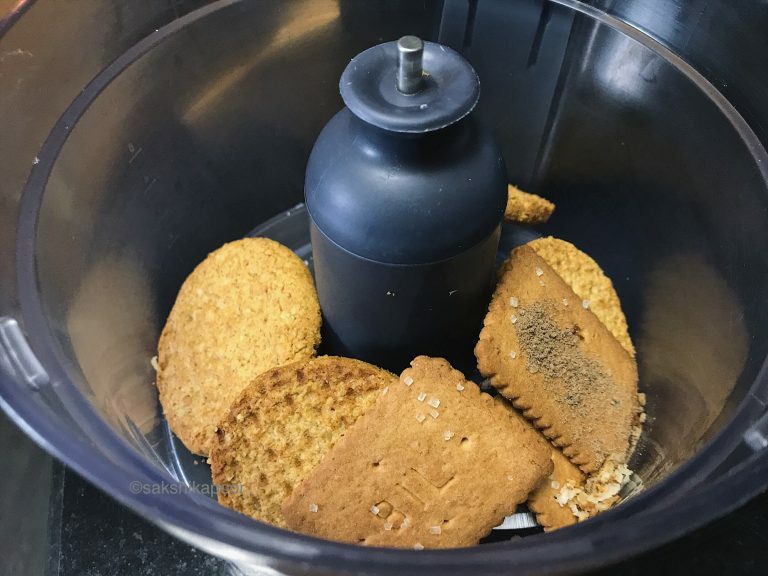 Start by putting the biscuits, nutmeg powder and a teaspoon toasted coconut flakes with a pinch of sea salt in a food processor jar. 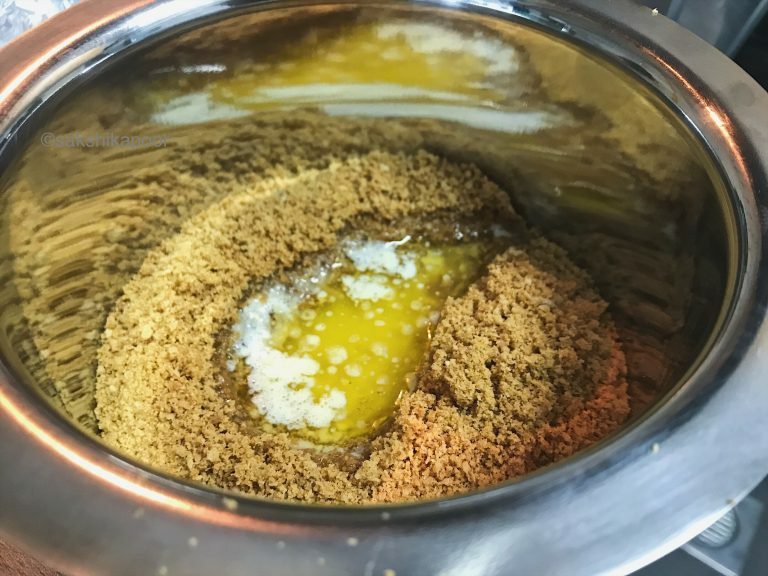 Process till biscuits turn into crumbs and eventually into a coarse powder. Take this biscuit mixture out in a deep bowl. Pour melted butter into the biscuit crumbs and mix well to incorporate. Grease a 6 inch tart tin with some melted butter or oil. Alternatively, you can also line a shallow dish with tin foil and then grease it. Transfer the biscuit crumbs and butter mix and spread it to cover the entire surface of the pan/tin you are using. Be sure to spread the mix to the walls of the tin/pan as well. Flatten and even out the surface with the help of a spatula. 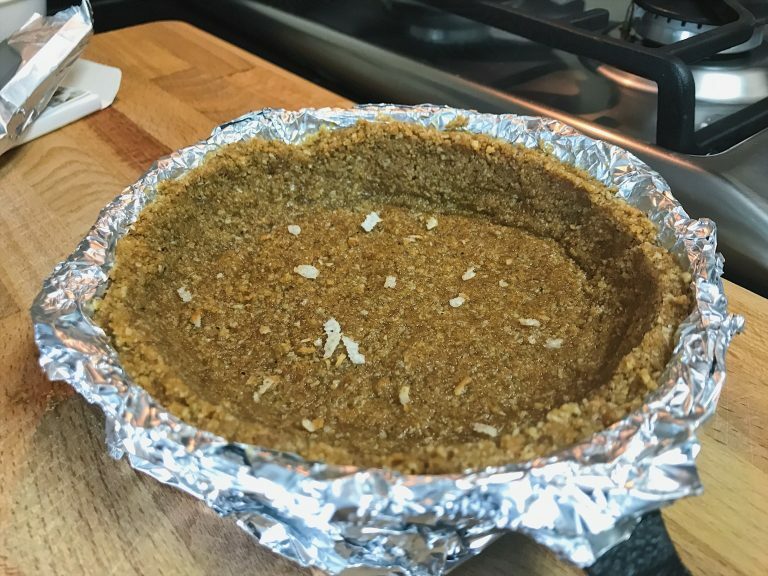 Sprinkle some more toasted coconut flakes and some sea salt on top and place the tart in the fridge undisturbed for around an hour. I mixed up a 70 percent Dark chocolate bar and a 99 percent (gasp!) dark bar in a 80:20 ratio. This was on a whim because I had so much chocolate in the fridge. You can use 60 or 70 percent dark chocolate bars or chocolate chips. Start by chopping the chocolate bar. Quickly transfer the chopped chocolate in a steel bowl. Place a saucepan half filled with water to boil. Once the water boils, take it off heat and place the steel bowl with the chocolate on top of it. You may have hold the steel bowl with tongs or a grip if it doesn’t fit on the saucepan. Just be careful to not splash the boiling water. 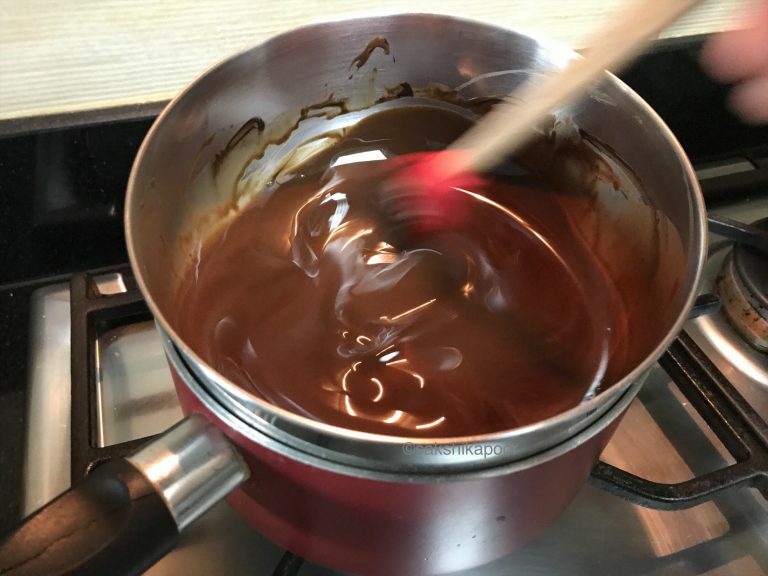 Stir the chocolate with a spatula and you will see it melt gradually. Add coconut oil and honey and start mixing till you see the surface of the chocolate turn shiny. Once everything is incorporated, add some coconut flakes and a pinch of sea salt and give it a final mix. In a small bowl, measure and pour smooth peanut butter. Microwave for 15-20 second on high or till you see it melt into a liquid. 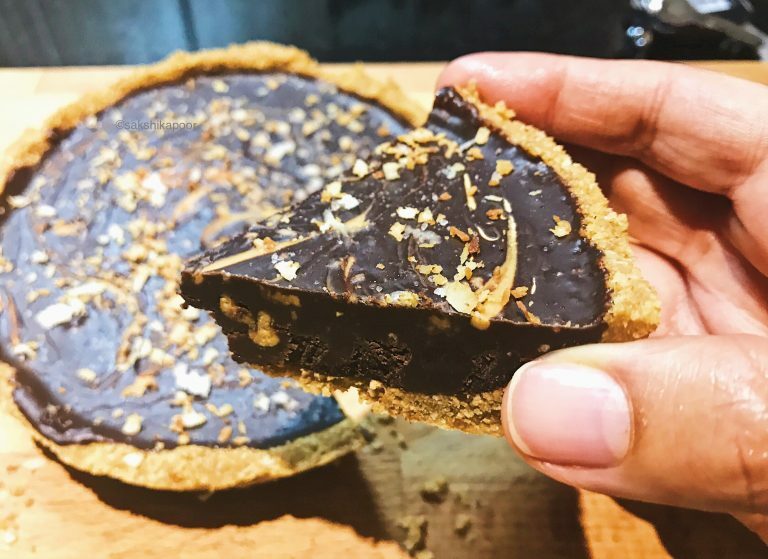 Take out the Tart from the fridge and pour the dark chocolate ganache in it. 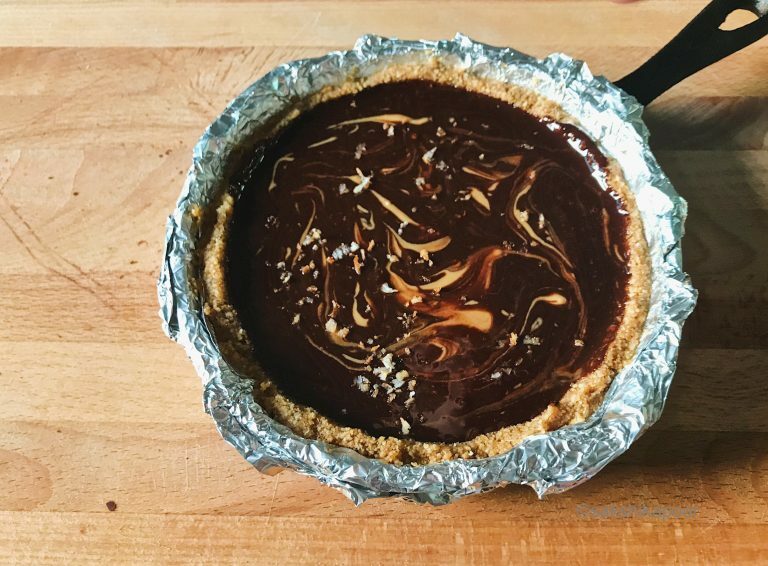 Once you have scooped out all the ganache into the tart, keep the melted peanut butter ready. 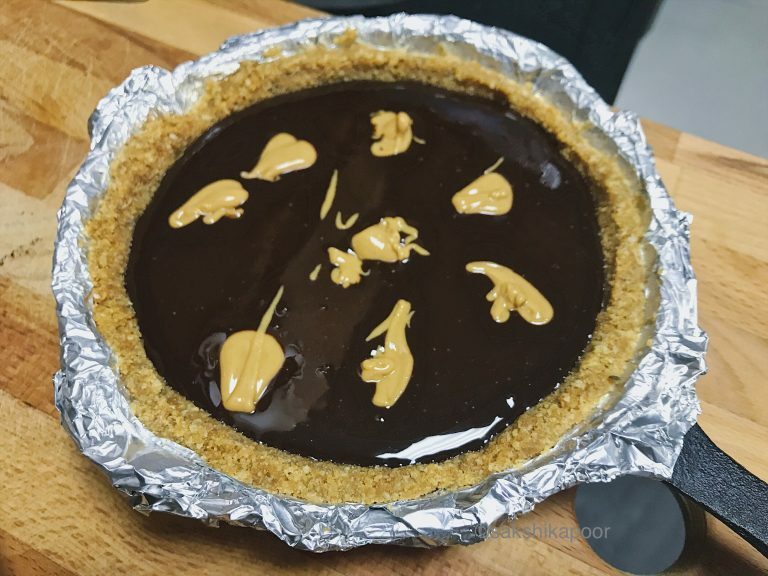 Place the peanut butter in dots on the surface of the ganache and make a marble texture by swirling it with the help of a fork or a knife. Sprinkle more sea salt and toasted coconut on top and place the tart in the fridge for at least 2 hours. Take out of the fridge at the time of serving and remove the tart from the tin. Slice the Salted Chocolate Ganache Tart into slices and serve cold. A delicious Dark chocolate Ganache tart with hints of coconut and sea salt! You just can't stop at one slice. Place a saucepan half filled with water to boil. Once the water boils, take it off heat and place the steel bowl with the chocolate on top of it. You may have hold the steel bowl with tongs or a grip if it doesn't fit on the saucepan. Just be careful to not splash the boiling water.